I love food… I love cooking… I find baking therapeutic. That’s what Mrs. Choux at Box of Recipes has to say about cooking and baking. Don’t we all, those of us who enjoy being in the kitchen find cooking a stress reliever or therapeutic as Mrs. Choux puts it? Wow, well said, cooking and sharing our prepared food creations with others is such a joy. Who doesn’t want to feel good, and make others happy in the process? I even like her logo, Mrs. Choux has great recipes in that little box. Now I wish to thank Mrs. Choux of the Box of Recipes for book marking and following our blog and leaving her comments as she visits. Thank you Mrs. Choux!! I am told I have to add this logo to our blog. So you should find it off to the left side column. I speak fluent Spanish, as I lived 5 years in Mexico and married a Mexican native. Favorite Food is Mexican food. I wonder why? I have a bucket list which includes places I would love to visit: Amsterdam, Greece, and Tahiti. Love Italian desserts B. 4 thumbs up for Coffee and C. Love Spring Time for all of the Flowers and D. They said I am out of here because I couldn’t make #7 into three parts. Thanks again to Mrs. Choux. Please don’t forget to visit her Recipe Box. This entry was posted in Blog Awards and tagged Choux, Choux pastry, Choux Recipe, Cook, Food, Mexican food, Pastry, Pastry bag, prepared food creations, Recipe Box, Recipes, Saulmon Ramirez, Slice of Heaven. Bookmark the permalink. It’s an honor to be mentioned among such great blogs and bloggers. Thank you a metric ton. Your welcome Jueseppi!! Keep bring us the latest news. Thanks Mrs. Choux, I am glad you enjoyed my reply. Yes I am excited about new recipes and preparing them. My grandfather was a professional Chef, so maybe it runs in the blood. BTW, I’m trying to learn Spanish again so in future maybe I should attempt to comment in Spanish. LOL! Also hope London features on your list of places to visit. I thought about it. I forgot about adding Ireland, it is so green, my favorite color!! Congratulations on a well deserved nomination for all the yummy recipes & health tips that you share! 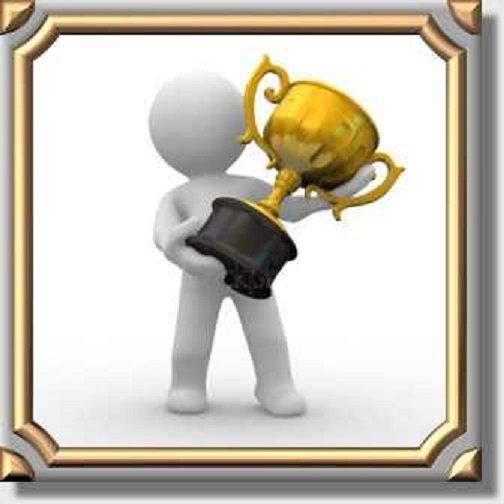 And – thanks for sharing the award with me. Your welcome RoSy!! You deserve it as well. That’s ok Jsckie. It isn’t mandatory. But I appreciate your words. I know you must be busy with your website and other daily activities. Have a great evening Jackie. Thank you so much for this nomination. Where can I go to read about it the rules on the nomination? Congrats on your nomination as well. You deserve such recognition. I have been seriously ill the last 3 1/2 months.I have been undergoing alot of test and I am still waiting for more. I was raced to the hospital on sunday for anaphalectic shock. Apparently I am allergic to one or more of my meds. I just came home Wednesday night. Yesterday I was back at the medical center with breathing difficulties and hives. I wasn’t sure if I needed to use the Epi-pen for the first time. I guess I am glad that I didn’t because they discovered I have pnuemonia on top of everthing else. The new meds with all the other meds have finally made me feel better this morning. I was counting my blessings for some improvement. I was praiying That this will be a turning point that the doctors are on the right path. Then I check my emails and blogg and see this. Thank you so much for brightening my day. I feel sad to hear that you are not well. What medical problems do you have, if you don’t mind me asking? If you are interested I have a health and nutrition website. I call it the Health News Library ( http://www.healthnewslibrary.com ). Maybe you might find something useful there for yourself. I was certified in Human Health and Nutrition. 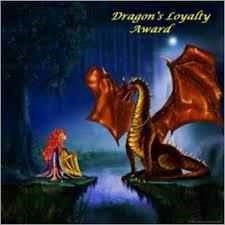 To get a logo, just Google or use Bing and search “dragon loyalty award”. Hey Honey I wish you the best and hope everything works out for you. I have had chronic diarrhea for almost 4 months… I can go to the bathroom up to 20 times in one night. I also have had bouts of vomiting… My blood pressure is haywire, because of all the pain and stress caused by symptoms to my body from this illness. I have lost a lot of weight rapidly and I am still losing weight. My body is not able to absorbs nutrients, because everything runs through my body so quickly… The top suspect for this affliction can be Crohn’s Disease. The doctors are running test to diagnose the disease. Thanks for concern. I will check out your site later.